A growing international community of institutions and organizations is actively expanding and enhancing appreciation of the work of Fortunato Depero. The list below includes leaders in presenting Depero-related materials and activities. Copies of The Bolted Book can be found in the collections of the institutions that are indicated with an asterisk *. Depero’s genius for publicity would be the basis of his legacy. As early as 1927, he’d published a personal portfolio deemed by Gabriella Belli “a unique specimen even by today’s standards.” Titled Depero Futurista and bound with two large industrial bolts, the book included some of the potent graphics he’d designed for such companies as Campari, interspersed with anarchic flights of typography that were essentially advertisements for himself. It was just the avant-garde calling card he needed to solicit commercial work from more forward-looking clients in Italy and New York. While the visuals were vintage Futurism, Depero successfully adapted them to a popular context. 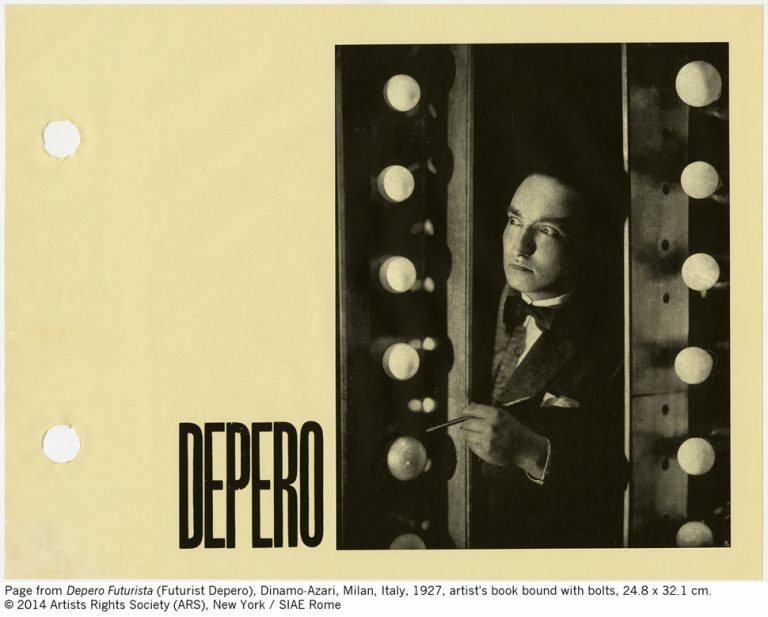 In yet another manifesto, written in 1931, Depero proclaimed that “the art of the future will be largely advertising.” He remained true to that commercial ideal until his death in Rovereto three decades later. If his name has faded in the ensuing half century, while Marinetti’s eccentricities are ever more famous, it is because Depero’s Futurist vision is now ubiquitous. We are living in his reconstructed universe. A fascinating discovery for me, in the show, is the multimedia virtuosity of Fortunato Depero, a Futurist recruit who introduced a repertoire of robotic forms and figures. He made terrific puppets, for performances and for children’s play, and theatre sets. Among his other feats as a commercial artist, he created the classic Campari Soda bottle. From 1928 to 1930, Depero lived in New York, mounting Futurist shows and producing stylish illustrations and covers for magazines, including this one. Review of “Italian Futurism, 1909-1944” at the Guggenheim Museum.